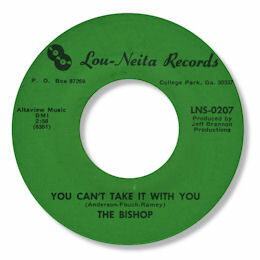 Lou-Neita was based in East Point GA and in addition to country music there were some really fine soul 45 issued as well from the likes of Gina Hill and Thelma Wilson. But I think the The Bishop's You Can't Take It With You may just be the best of them all. 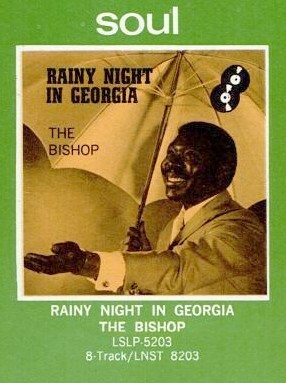 Gruff throaty and full of power his vocal here is just what the doctor ordered the epitome of southern soul singing. And you can certainly tell how he got his stage name - there's some serious gospel flourishes here. The chord changes of his self penned tune are fine as well - and the female singers chime in just beautifully. And of course the lyric is unanswerable! Sadly the Bishop's other 45 is nowhere up to this standard. UPDATE ~ Bosko Asanovic has kindly reminded me of a gospel album entitled "Phone Call From Heaven" on Michal MR-249-SI on which an artist called "The Bishop" has a couple of tracks - the title one and "Trouble of this world". Does anybody know if this is the same guy? FURTHER UPDATE ~ In a fine display of detective work Pete Nickols has found this Billboard ad from August 1970 indicating the release of an LP by The Bishop. Nobody I've been in contact with has ever seen this album however - does it really exist?